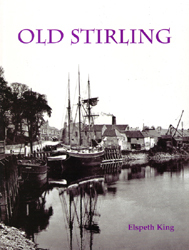 Always at the crossroads of Scotland�s geography and history, Stirling has been described as �the brooch which clasps the Highlands and Lowlands together�. This collection of photographs from both public and private collections includes pictures of artifacts as old as the 15th century Stirling Jug showing the iconic Stirling Wolf (a symbolic beast it shares with ancient Rome). The photographs are accompanied by a detailed and fascinating history of the town from the 13 century to the present day. More modern images include �Tattie Howkers� from the collection of James Gray and Co., Seed and Agricultural Merchants since 1865, Mrs. Ging, hawker of rags and second hand goods, with her donkey and cart outside Albert Hall, Dumbarton Road and the proclamation of the accession of Queen Elizabeth at the Cross on 6th February 1952 by Provost James Plank.